Maya Angelou said it best: “In diversity there is beauty and there is strength.” Wednesday’s Multicultural Day, held on the Secondary campus, certainly embodied this. The sun burnt brightly overhead. Sausages turned on the barbecue. Mouths watered. Parents, students and community filled the bleachers to capacity. The stage was set. Mr Hiron, Drama Co-ordinator, accompanied by one of our Year 11 students, opened the annual display with two stunning Indigenous dances. Having been officially welcomed to country, it was time to light up the stage. Sitting, standing and cheering, the crowd were decked in the costumes of their heritage. From El Salvador to Papua New Guinea to India, the bleachers were awash with students of all ethnicities. It was a display of pride, admiration and celebration. All in the name of making a difference: this year, money raised from free dress were donated to the Tumour Fund. 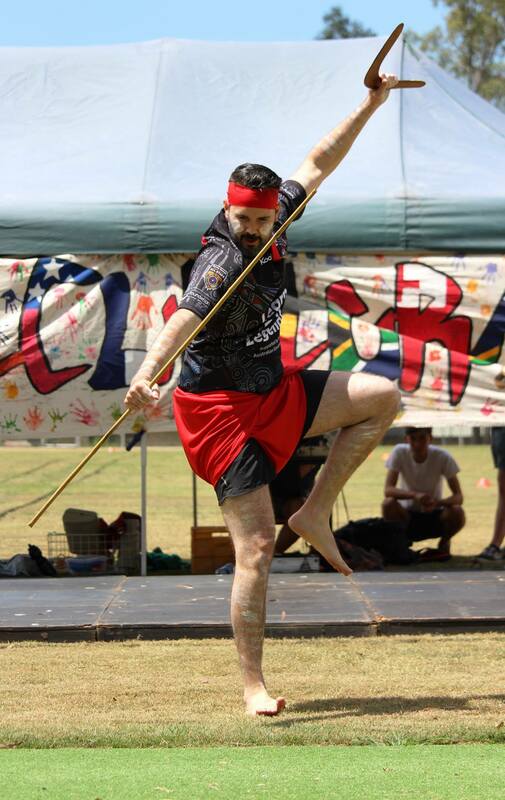 Drama Co-ordinator, Mr Wayne Hiron celebrates his Indigenous heritage. Bamboo poles beat, tapped, and carried the beat as Filipino dancers, dressed in exquisite national costume mesmerised with their tinikling. The intricate footwork required tripped up all comers who gave it a try. After months of afternoon rehearsals, more than a dozen Polynesian girls, students from across the year levels, performed with great grace, big smiles and intricate hand-movements. Similar in number were the energetic Polynesian boys. They fired up the crowd with a haka and an original dance number. But there was a more serious side to the day. Students were moved to tears as rising rugby star, Christine Okesene in Year 9, dedicated a song to a classmate reeling from personal tragedy. Her song, in Maori, drifted across the College oval to great applause. A beautiful tribute to a valued friend. Every year, two new signs are added to a poll on the Secondary campus service road. They show the onlooker where our students come from and how far they’ve come to be here. It reminds us that we might all be different, but there is something greater that unites us. Can you guess which ones were added in 2016? Westside Christian College is proud of its multicultural heritage, offering opportunities for everyone. See more great images from the day on our Facebook page.